Dream in their hermit cell. The flower of heart expands. For each young slumberer’s head. Fit for a heaven of love. And heal the wounds of woe. 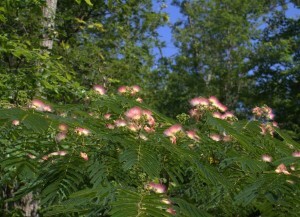 Mimosa seems to be a flowering tree that many people adore. The unusual blossoms draw one’s eye to their hot pink fuzziness. Mimosa flowers stay open at night and perhaps that is a draw for some. We’ve seen it bloom one year and not the next and that’s probably due to the poor soil we have up here on the mountain. Unfortunately, as Mrs. Sigourney suggests, the long pea pods that develop from the blossoms all too easily start the next generation…”Up springs another by its side”…”A seraph-planted germ”. It can be invasive! 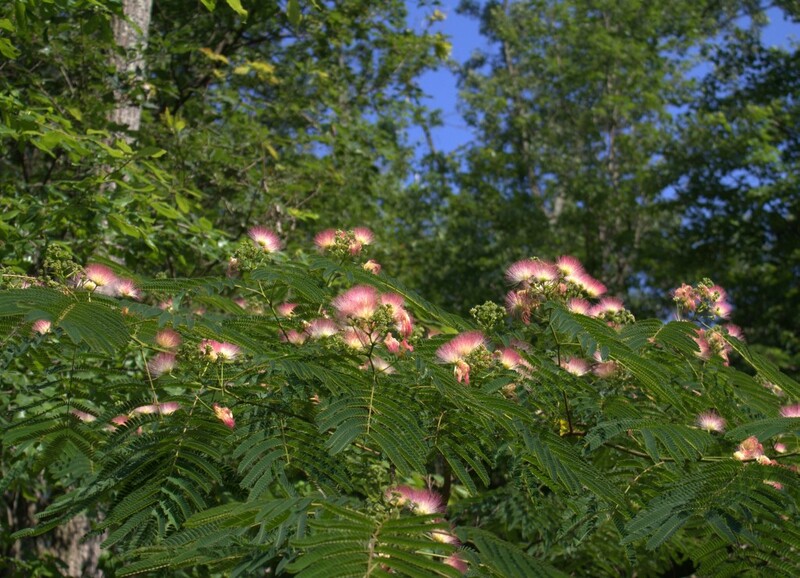 A flowering mimosa tree has a light sweet scent that works its magic on gentle breezes — and in perfume. We like to take the blossoms and float them in shallow containers for table and mantlepiece decorations. Come back next Friday for the next installment in our series of flower poems from Mrs. Sigourney’s The Voice of Flowers, “The Garden and The Rain”.